Music festivals, Vogue, and Pinterest have all proved that floral crowns are still the accessory du jour. But it's the wedding industry that's leading the floral crown revival. Everyone from the bride to the flower girl are donning fresh blooms of all varieties, adding that extra touch of romance, femininity and enchantment to the day. One may think a few sprigs of greens and a bloom here and there is all it takes, but it’s much more than that. 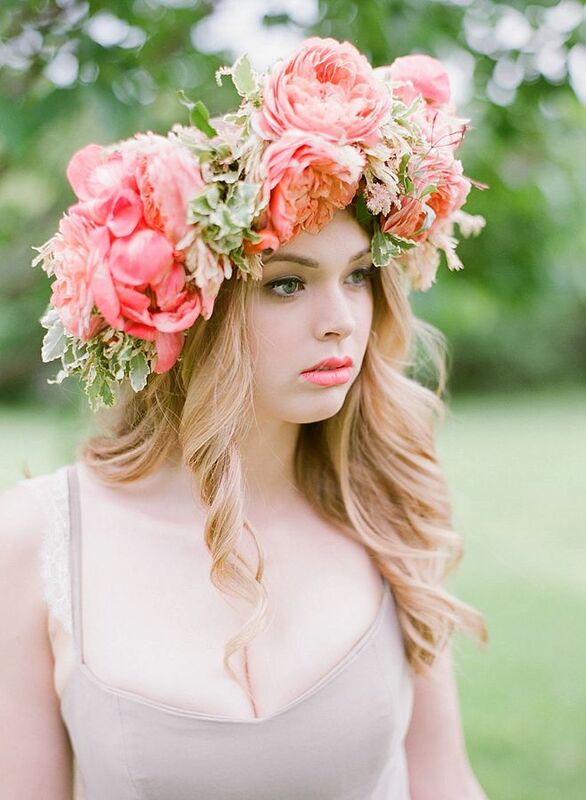 In fact, it takes a village to choose the best floral crown for your wedding day. 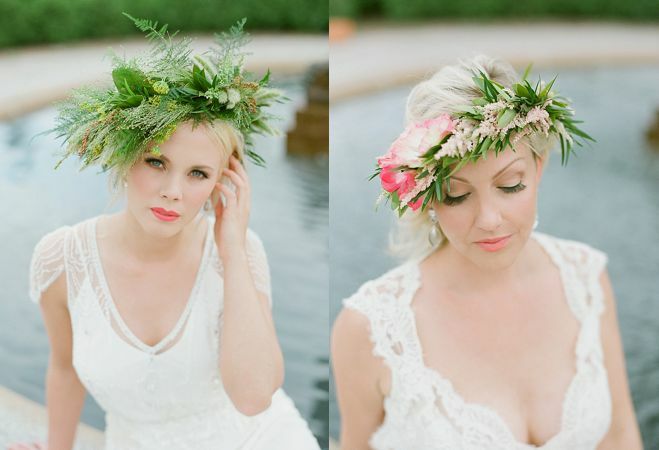 Hairstylist and Makeup Artist Julie Swenson notes, "A common challenge for both brides and vendors is deciding on what type of floral crown is best. It takes a village to make this decision." To start, you'll want to choose a crown that complements your dress. 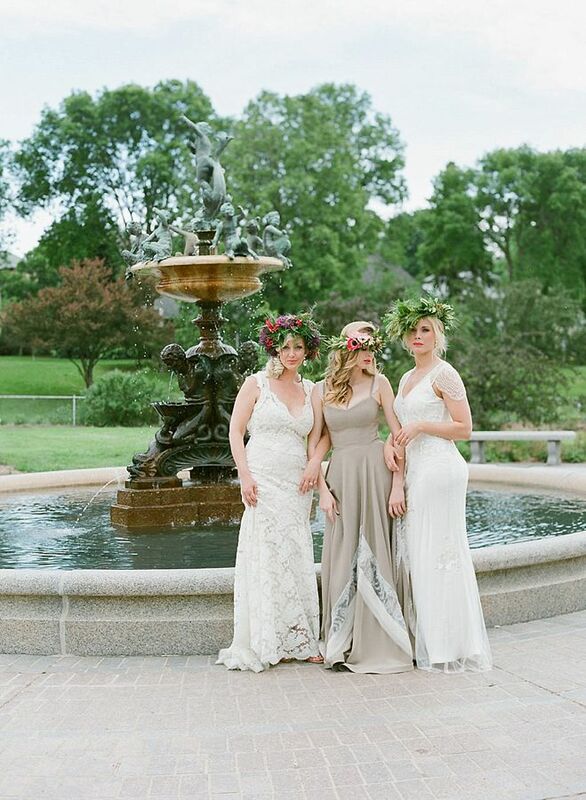 Often times, if a dress is quite ornate, a simple and neutral toned floral crown is selected to enhance but not take away from the glamour of the gown. While on the other side of the spectrum, if the chosen bridal gown is simplistic and for the most part unadorned, then an oversized floral crown bursting with vibrant colors and an assortment of blooms will definitely not compete with the simple chic-ness of the gown. You'll want to speak to your florist about what flowers are long-lasting and will not wilt or wear from time and weather. First determine the purpose of the crown—will you be wearing it all day or just a portion of the day to capture some whimsical moments and photos? Some blooms that don't last long are sweet peas, poppies, and lilies. Petite blooms like spray roses, berries/greens, and jasmine are better choices. If you're going big and robust with your crown—go for it! But don’t forget to consult with your photographer and wedding planner to ensure it doesn't overpower your look in photos and the desired vibe of your wedding. Practically speaking, choosing a simple crown will be easier to wear all day and won't take away from the other details of the day, while an oversized and showy wreath might be perfect to wear for a smaller portion of the day, such as in out-door photos or first-look photos. You'll want to make sure your crown is do-able with your wedding day hairstyle. Consider all down with loose curls, or all up with soft pieces of hair left out to frame the face. A side braid or cascade is also a lovely choice for a soft, romantic, free-spirited style.